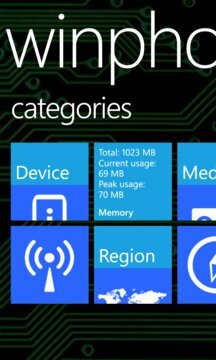 WinPhone Info displays real-time info about your Windows Phone device in an easy-to-navigate, Modern-styled interface. View detailed info in the category pages, including device, memory, media, miscellaneous, network, region, sensors, and location. Tap the favorite icon next to any item to add it to the favorites list on the main page for quick viewing. 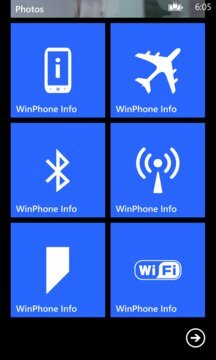 WinPhone Info also provides settings launcher Live Tiles for airplane mode, bluetooth, cellular, location (Windows Phone 8 version), and wi-fi that you can pin to your Start screen for convenient access to your phone's settings. Other features include sharing your location and current address via email or SMS and an email report of all data. Please feel free to submit feedback and suggestions via the support and feedback menu item in the app.